Singing can change your life by Alexandra Conner BA Hons. Some may find the above statements hard to believe, but I can confirm by what I have experienced during ten years of teaching voice that it IS true – anyone can sing! I have also discovered that singing and developing the voice can produce benefits that far exceed just singing well. I am also passionate about the emotional, physiological, intellectual and aesthetic benefits of singing. We already know how music can have a profound impact on peoples lives – it speaks to the soul. I have seen the joy of singing transform lives, including mine! One 15-year-old girl who was excluded from the rest of her class had to be continually monitored as she would often just walk out of school. Her teachers had given up on her. She had elected for Music GCSE but never attended lessons. I spoke to her music teacher, persuading him to let her have singing lessons at schoo. He agreed with reservations. After two weeks she was turning up to all her lessons on time. On asking her about her surprise turnaround she told me she didn’t want to have her singing lessons taken away so agreed to the conditions set. 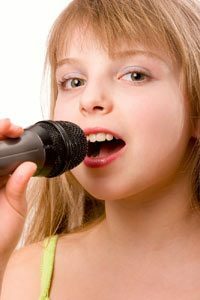 She said that during her voice lessons she felt at ease and she had a means of expressing herself without being judged and more importantly she could be herself – one of the side effects of learning to sing is that you discover the REAL you. My only wish is that she had taken up singing earlier and maybe her time at school would have been happier. Another 13-year-old girl who was rather shy came to me for lessons claiming to be tone deaf even though she enjoyed singing at the spiritualist church! After a time she came to realise that she didn’t have to create the right pitch in her throat; she learnt to trust her ears – her tuning was good. As a result her self-confidence grew and grew. She now sings with a Theatre School. She also suffered with asthma which she said improved significantly. Singing can benefit you whatever your age. Eileen and Enid shared an hour’s lesson every week. Both ladies had been retired for some years. They saw their lesson as therapy for the body and mind. They found the breathing exercises helped them in numerous ways; they said they felt energised and after their lesson, felt happier and healthier. They would sing Duets, and we had lots of laughs together. In fact they were so taken with the benefits that singing had given them they wanted me to give a workshop in their local church. Improves posture as you expand your chest and straighten your back and shoulders. Over time everyone develops a physical awareness of his or her body in relation to holding and releasing muscle tension. Exercises the respiratory muscles. Asthmatics gain particular benefit. Slower deeper breathing also decreases stress, anxiety and depression. Improves circulation, oxygenates the cells and boosts the immune system. Keeps your voice youthful – the less age battered your voice sounds the more younger you feel. Diaphragmatic breathing helps modulate the speaking voice (as used in Speech Therapy): good for teachers, lawyers, salespeople, actors, politicians, clergy and public speakers. 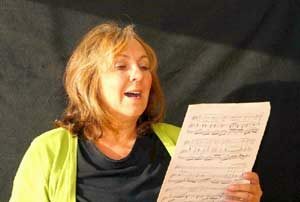 Provides some aerobic exercise for the elderly or disabled – its never too late to learn to sing. Accelerating personal growth through self-knowledge. Lifts mood by taking your mind off the stresses of the day. As you relax, singing encourages the release of pain-releasing endorphins. Bolsters your self-confidence to tackle other challenges in your life. Sound can heal: some Music Therapists adapt the healing song of the American Indians to help people sing their way back to health. Stammerers and stroke victims may benefit. Soul contact lights up barriers the Ego presents thus enabling expansion of consciousness. You find your uniqueness as your voice is unique to you. This is very empowering and creates inner confidence. You learn to love and trust yourself, not be a hostage to your Ego (fears). You invite the energy of creation to your consciousness because you are the source of the sound. Increases self-respect, What you think about yourself and about the world. You are what you think! There are numerous other benefits singing can give you what’s more its Fun too! ‘Music is a powerful, unique form of communication that can change the way people feel, think and act. It brings together intellect and feeling and enables personal expression, reflection and emotional development… It also increases self-discipline and creativity, aesthetic sensitivity and fulfilment. Alexandra is a Vocal Coach and Tutor for Essex Music Services a division of Essex County Council and teaches Singing in Schools. She also has a private practice in Southend.